Holly and Stuart recently enjoyed a delightful respite from New England cold winter in warm and very green Palm Beach. 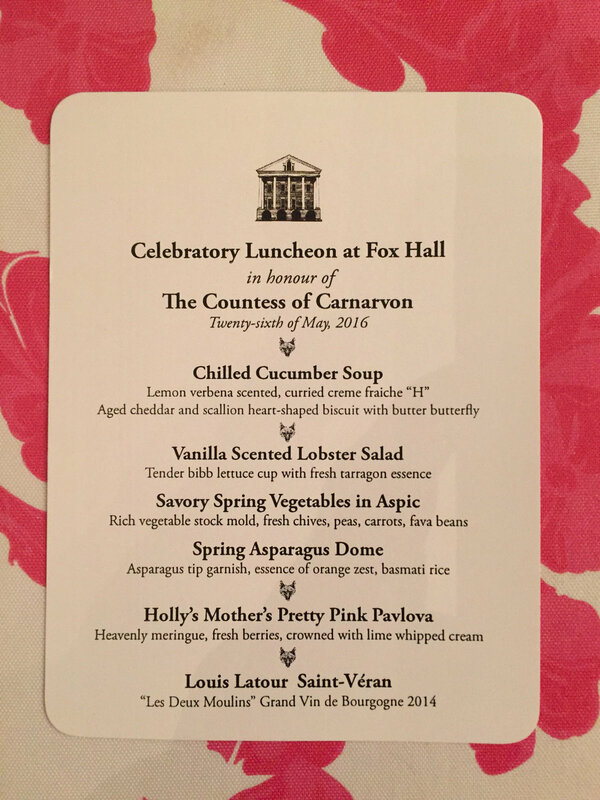 Another year for Holly’s “mother-daughter-granddaughter” luncheon. In 2018, it was at the newly renovated Ritz Hotel. 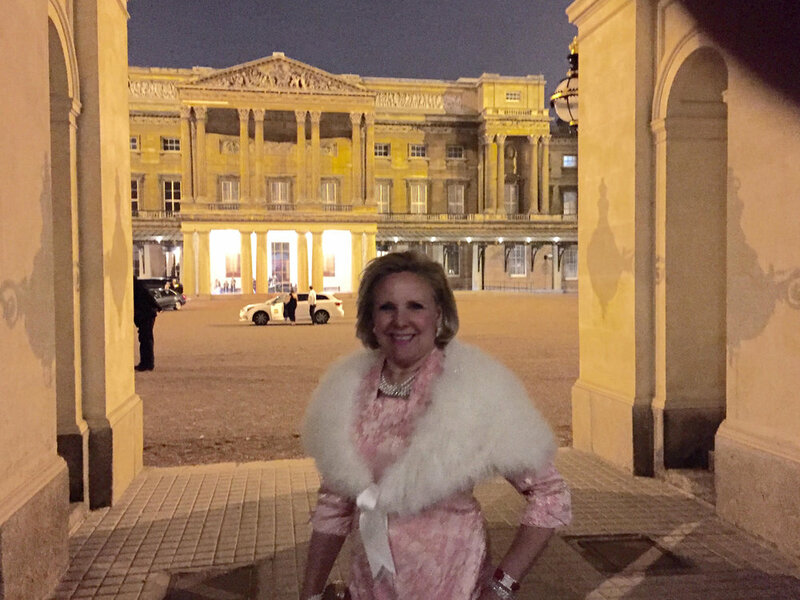 Holly recently attended an auction at the Paris Christie’s. There’s always eager anticipation before an auction commences! Holly was a guest at the last New Year's Eve fete at Eyrie Knoll, owned by Dr. and Mrs. Paul R. C. Sullivan, before they decided to sell their house. 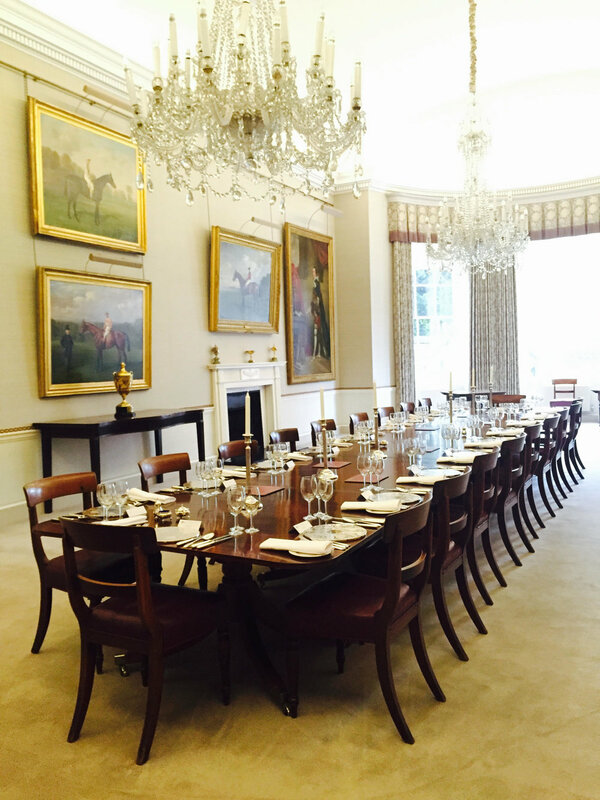 It was a decadently festive dinner party for 14 lucky guests. 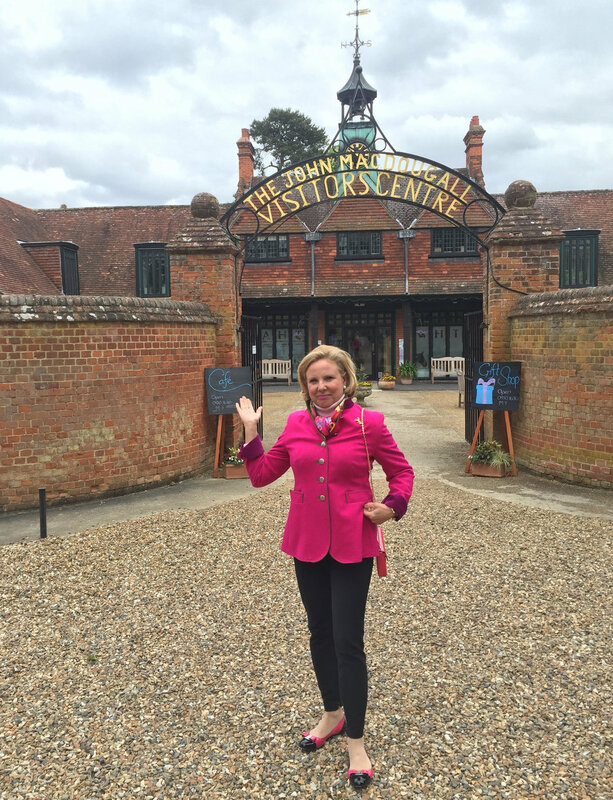 She filmed her pilot show for her television show there, featuring not only their brilliantly appointed house but also their outstanding collection of French du Paquier porcelain — the largest privately owned collection in the world. 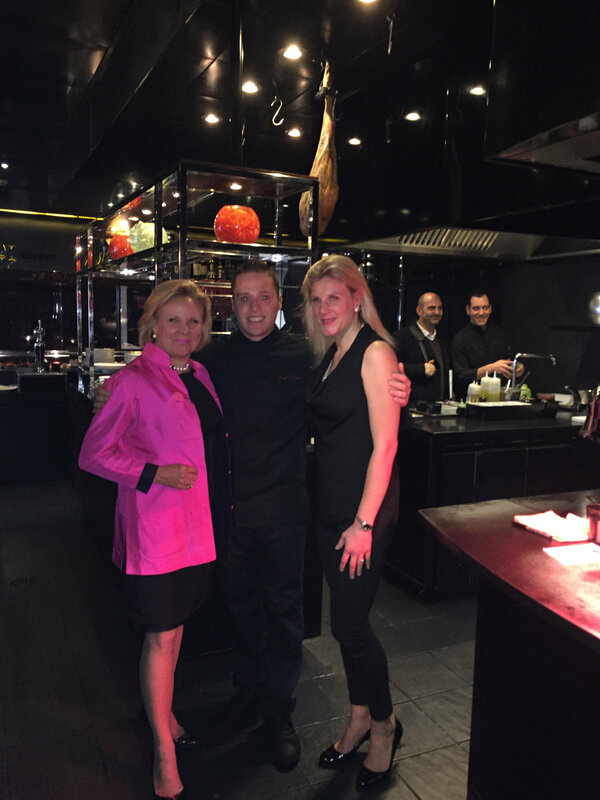 Holly with her daughter Alexandra recently visited the head chef at Alain Ducasse's Atelier Restaurant in Paris. With the cuisine presented right before their eyes, the two immediately felt the attention to detail. 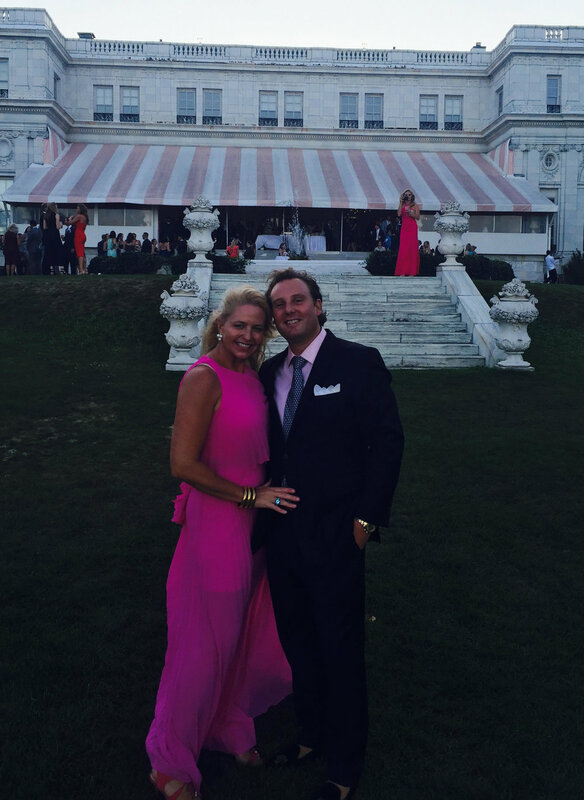 Holly’s son, Stuart III and his wife Karen, were radiant as they attended a Palm Beach function. 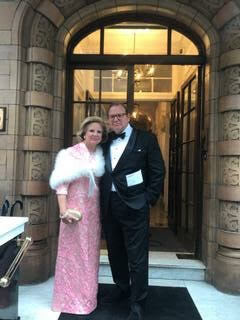 As the guests of the brilliant Director Peter Lyden of the ICAA (Institute of Classical architecture and Art), Stuart and Holly were honored to attend the celebratory 2018 Arthur Ross Awards Dinner at the University Club in NYC in May 2018. Holly with trusted friend Nancy. 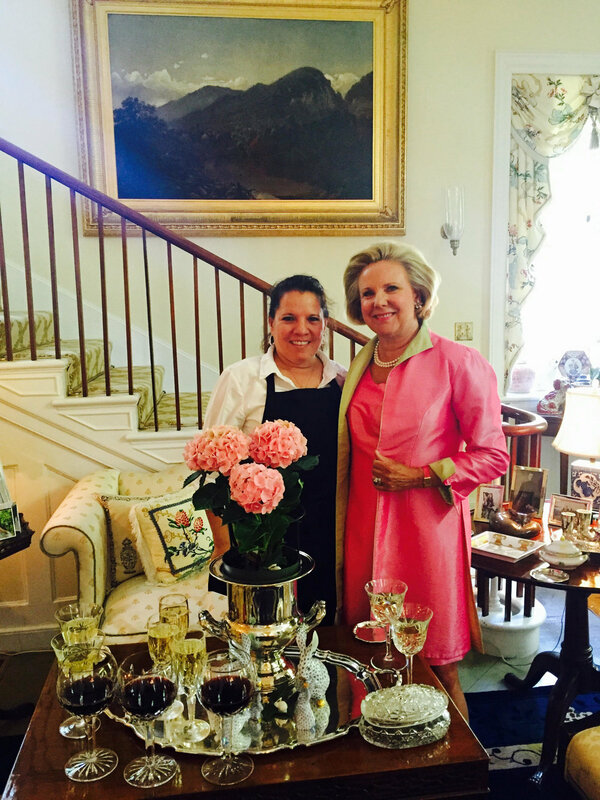 Nancy is the quintessential "master server" at all Fox Hall functions (and is also referred to as the family’s ‘General in Command’)! Holly was so fortunate to enjoy an extraordinary private lunch with the Director of Dior in their flagship store in Paris back in 1995. 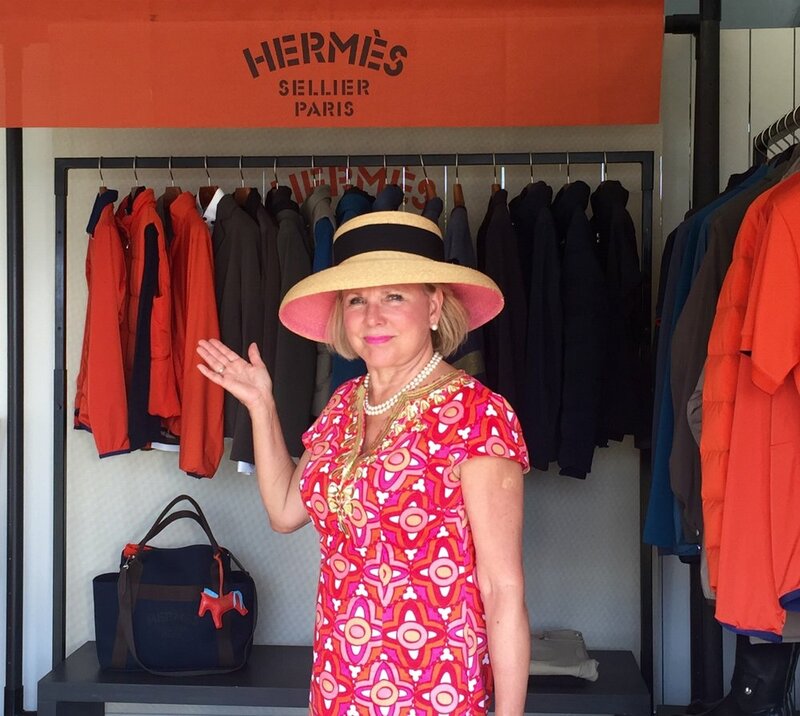 On a recent trip to Paris, Holly was drawn to their gift and decorative accessory department in the center of the store. Holly enjoyed the 2018 Christmas display outside Dior flagship store in Paris. It was over the top! 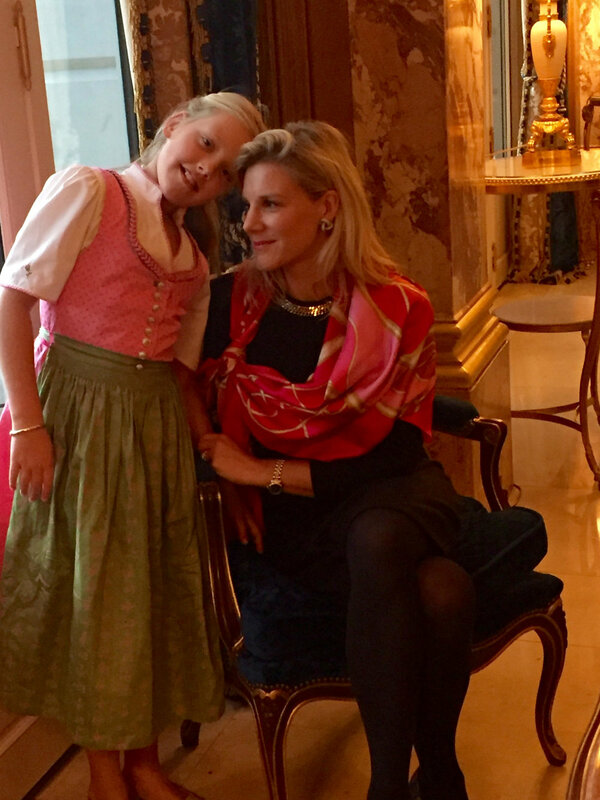 Holly & family were recently greeted by the chef at Relais Louis XIII — always a culinary delight! 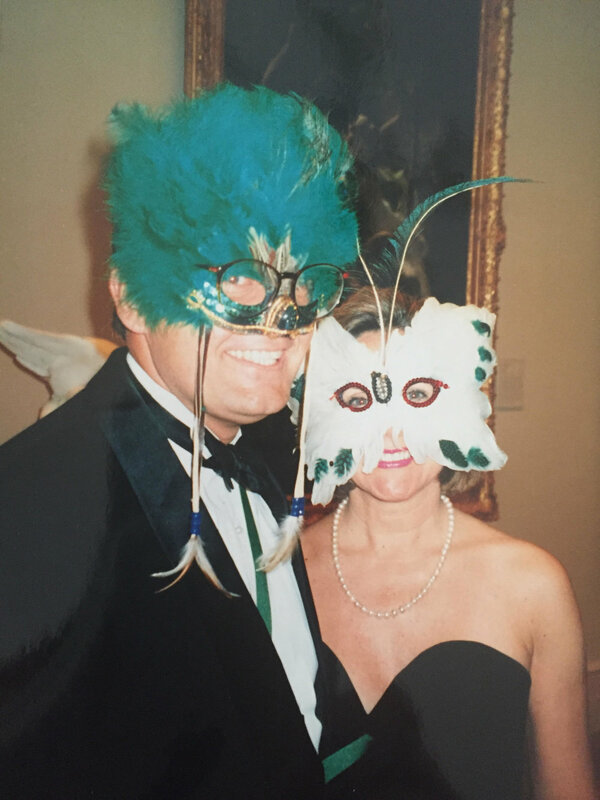 Ten years ago, Holly & Stuart attended a YPO (Young Presidents Organization) private masquerade gala at the Metropolitan Museum of Art. 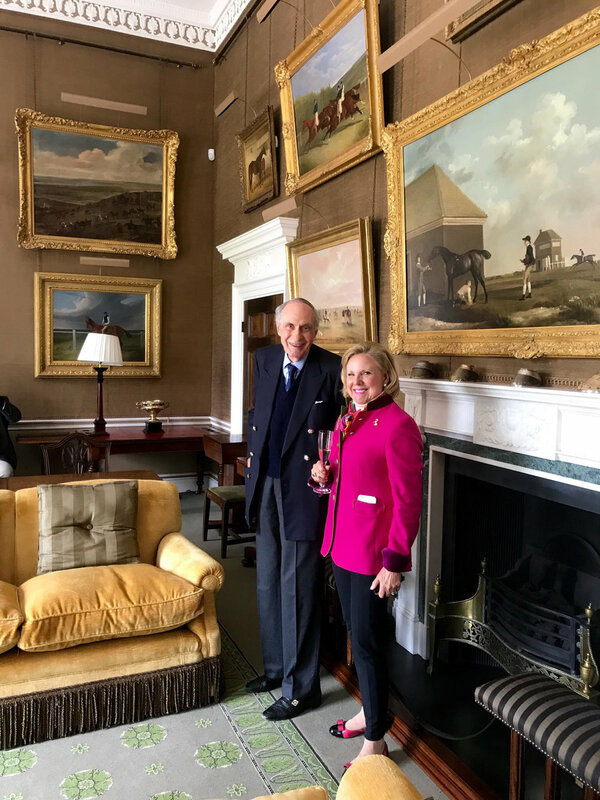 Holly was so pleased to show Heather Grayling, owner of Vivid Hue and the Director of the Hill Stead Museum, one of her favorite paintings, by Paul Maze. It is of the Henley regatta. Many of his works are in Blenheim Palace, as the artist was good friends with the 11th Duke of Marlborough. 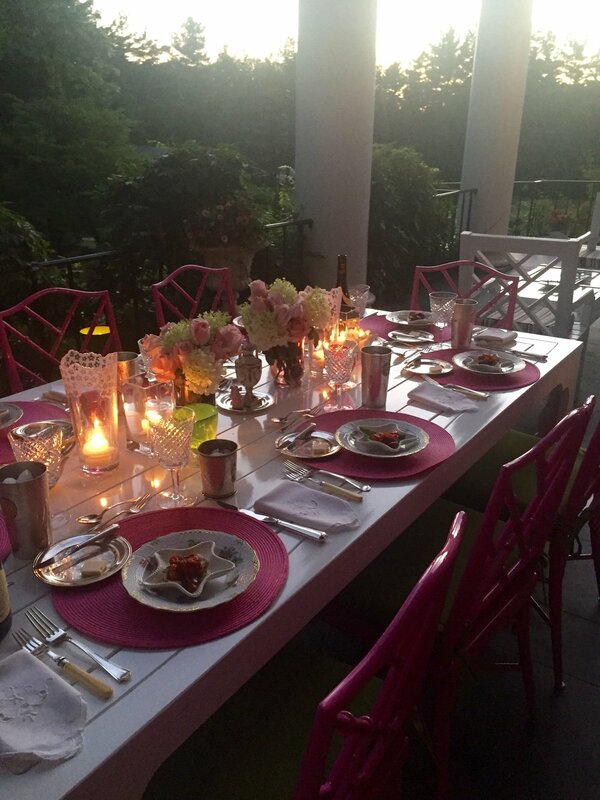 Recently, Holly hosted a late afternoon ladies party to welcome her daughter-in-law, Karen Holden, into the "Village" of Farmington,. The champagne was flowing! 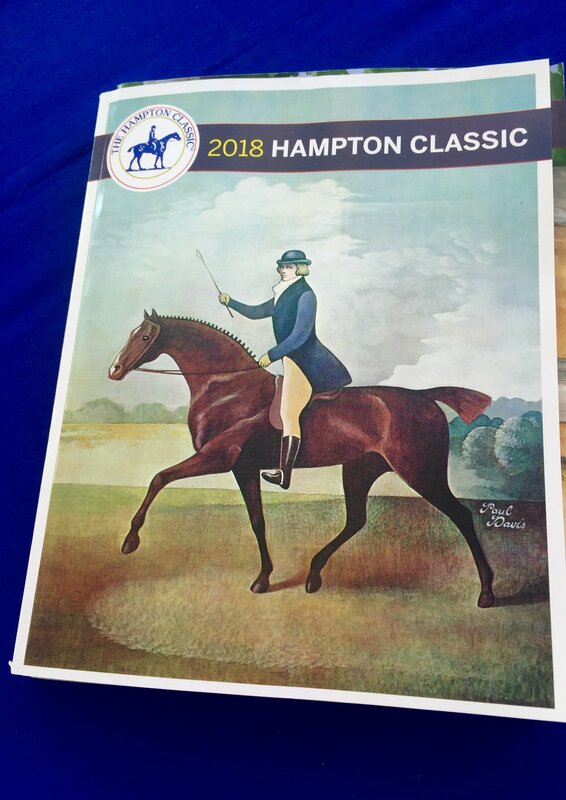 Holly had a wonderful day at the Hampton Classic Horse show with her family. 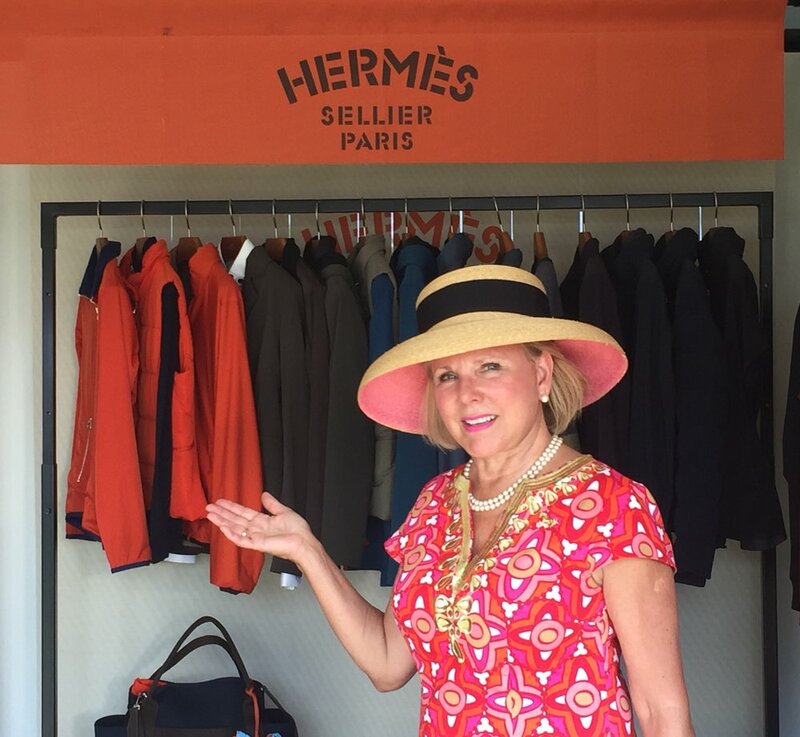 Of course, they just had to stop by the Hermes booth! 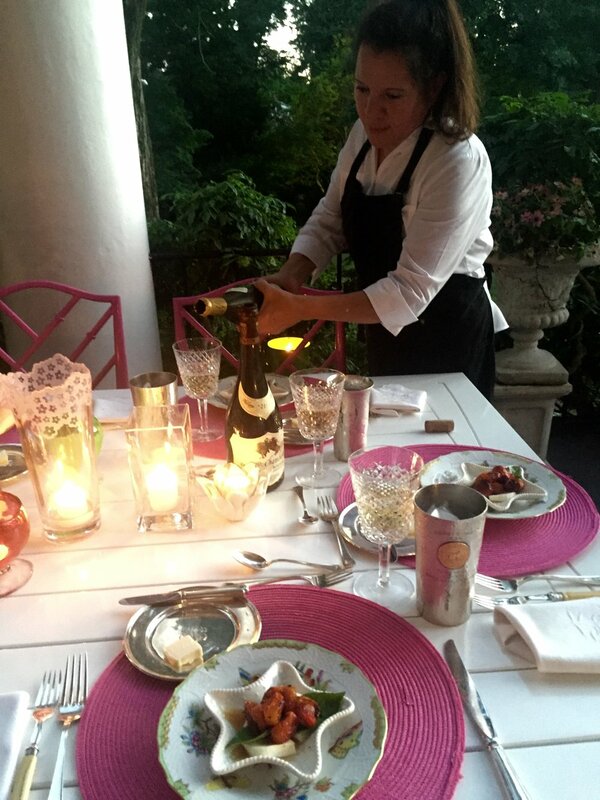 Impromptu parties are oftentimes the most fun! 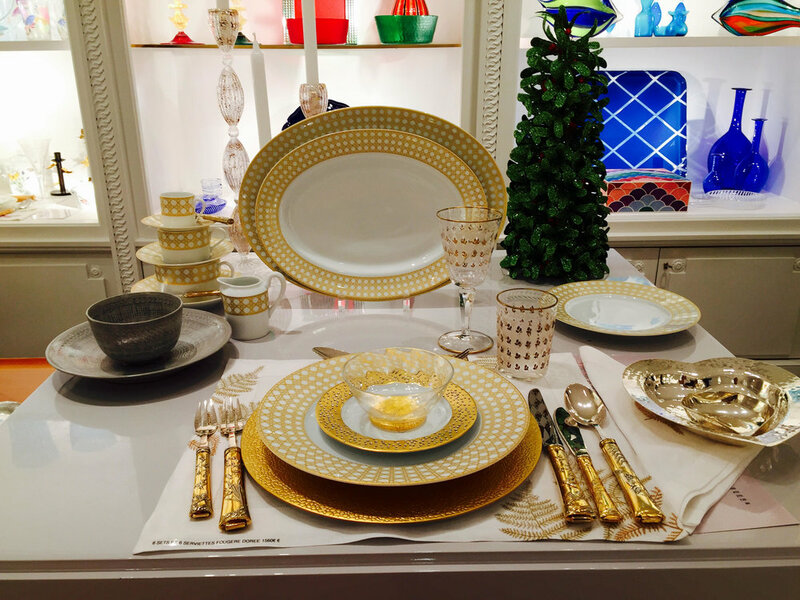 The softness of this table setting is certainly complemented by the summer haze. 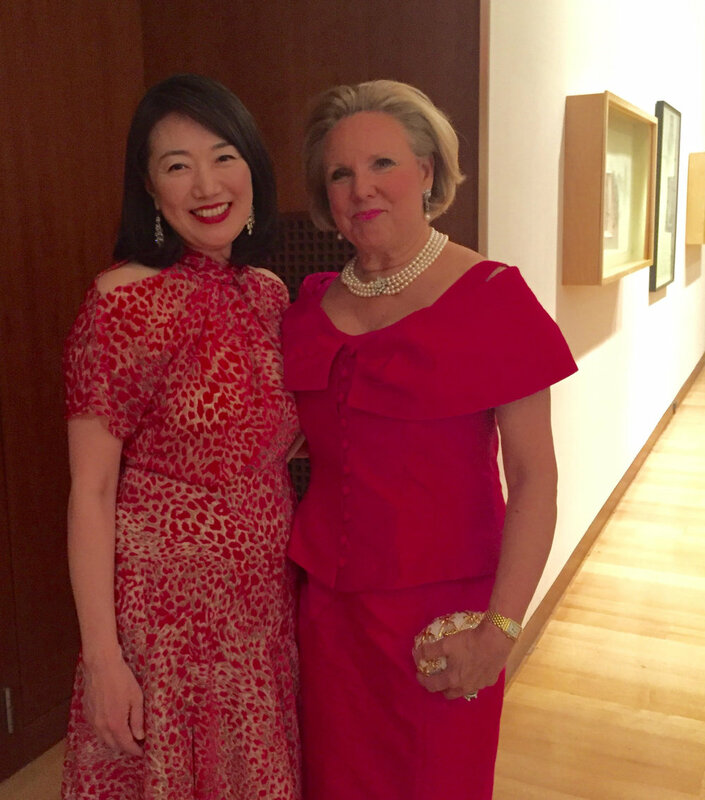 In May 2018, Holly joined the Director of the New Britain Museum of American Art Min Jung Kim at the museum's Director's Dinner. 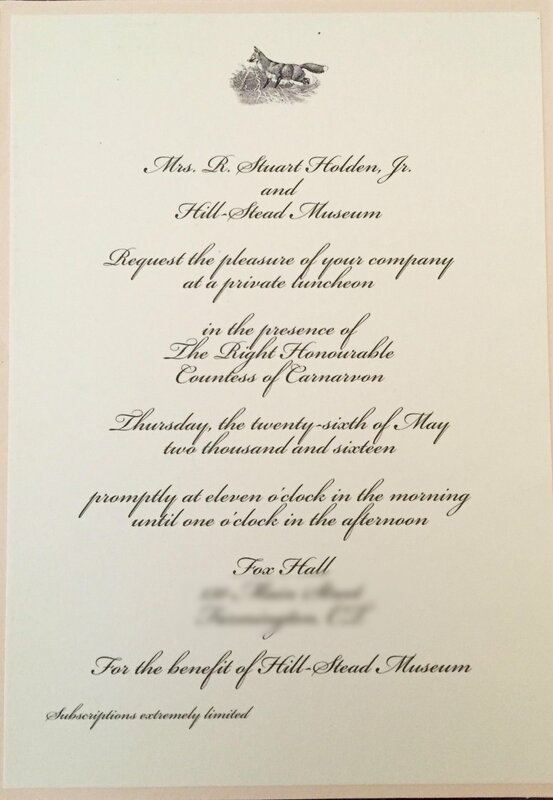 As a trustee to the museum, this dinner is always a cherished event for Holly. Holly enjoyed hosting the charming and extraordinary author of The Bee Cottage, Frances Schultz. Frances recently stopped by Fox Hall for some iced tea on the verandah after visiting Hill-Stead Museum in Farmington. If you have a chance, visit her lovely website! 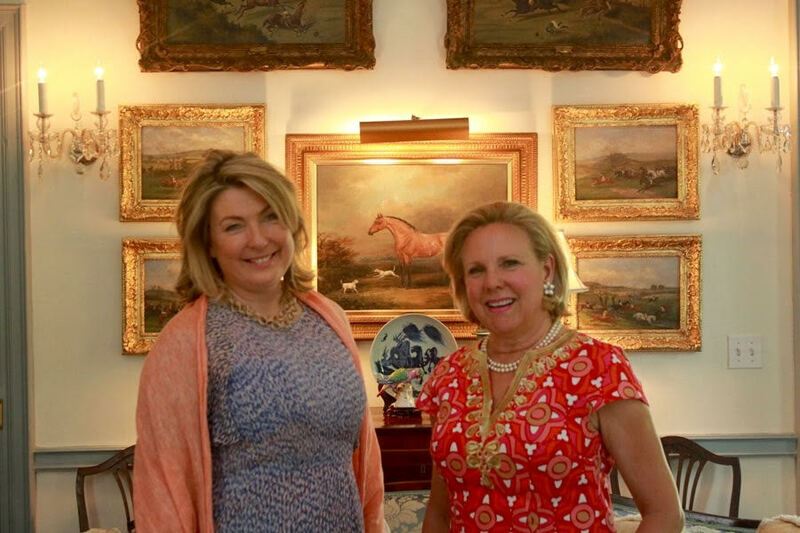 Holly hosted a private meeting with the esteemed British jewelry designer, Elizabeth Gage, at her exquisite gem box showroom in London in June 2018. 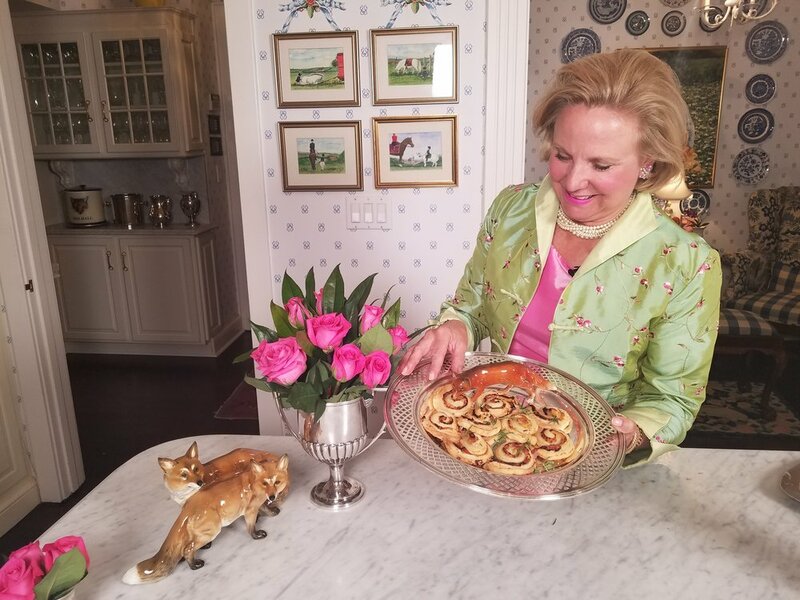 It has been three years since Holly hosted a dinner party in her honor at Fox Hall so the two adored catching up to view her newest collection of elegant jewelry. The collection will be showing in NYC in October 2018 if you wish to make an appointment for a viewing. Like a candy store, it'll be hard to leave empty handed! In June, Holly was honored to spend some time with Judy Woodruff, who has worked with public television since 1976 and is currently the Anchor and managing editor of PBS News Hour. 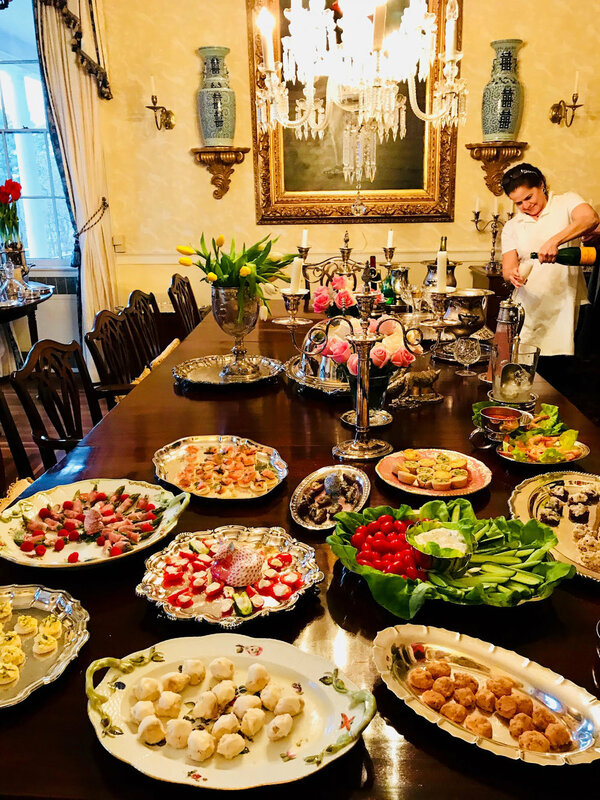 CPTV in Connecticut held an important fund raising event promoting dedicated women and Judy graciously left Washington DC, with just enough time to be the guest speaker, before returning to her post for the news that night! She is an inspiration. 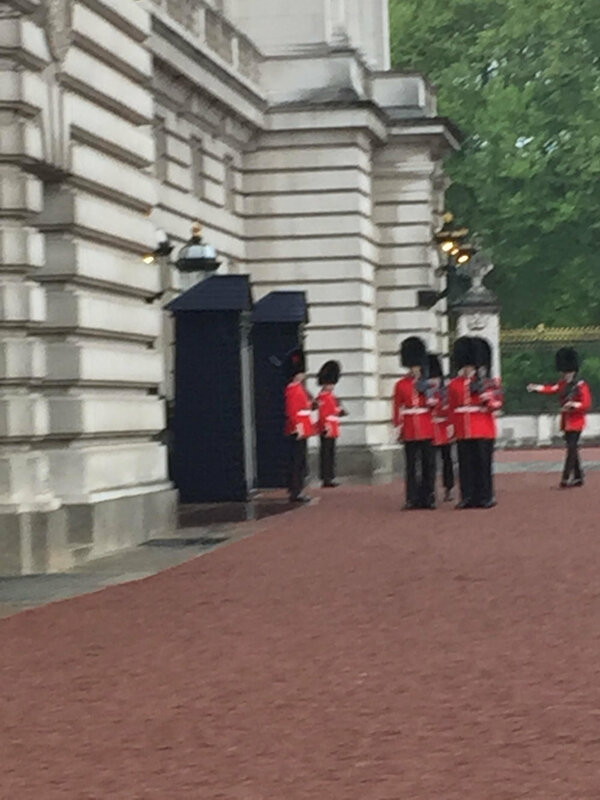 Her Royal Highness The Princess Royal hosted a stunning celebratory reception and dinner in honour of the AHT Animal Health Trust 75th Anniversary. 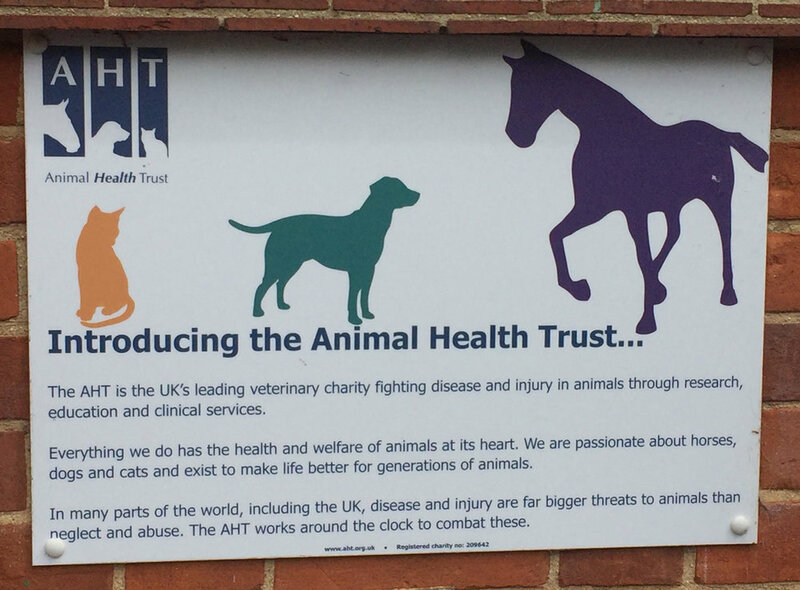 Holly receiving a VIP tour of the Animal Health Trust (AHT) in Newmarket, England. The animal hospital and facilities for equine and small animals are of the highest caliber. The organization recently celebrated their 75th anniversary. 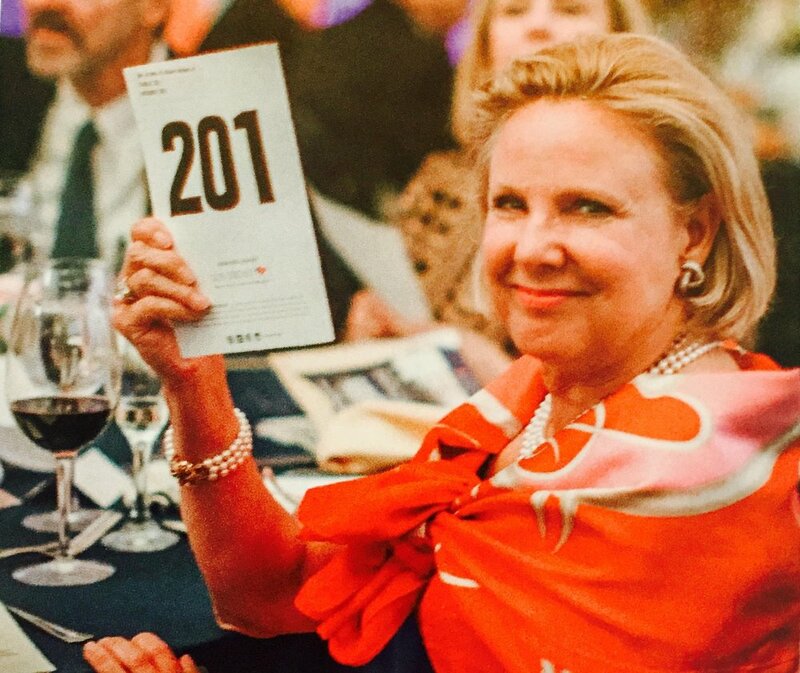 Holly had a fabulous time bidding for the many goodies that were generously offered during the May Benefit live Auction gala for the museum. 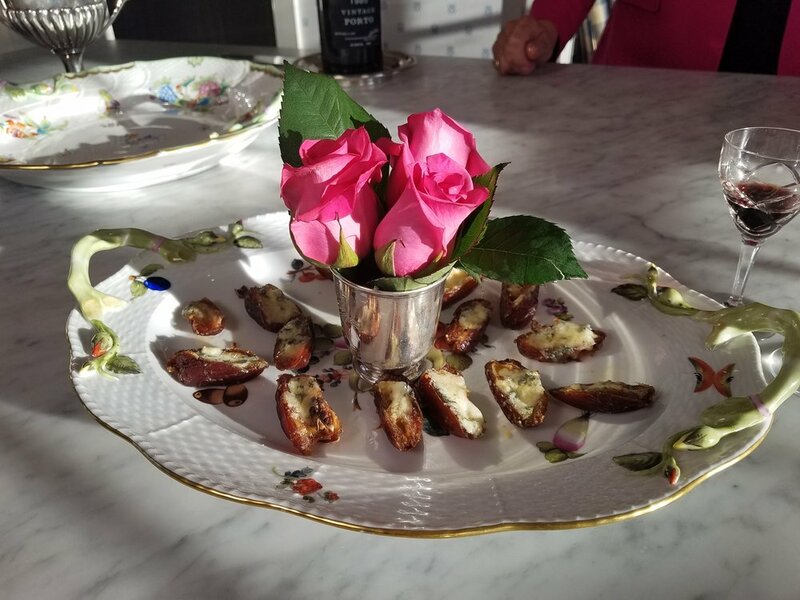 And their guests can expect to enjoy her Stilton stuffed dates and prosciutto pinwheels! 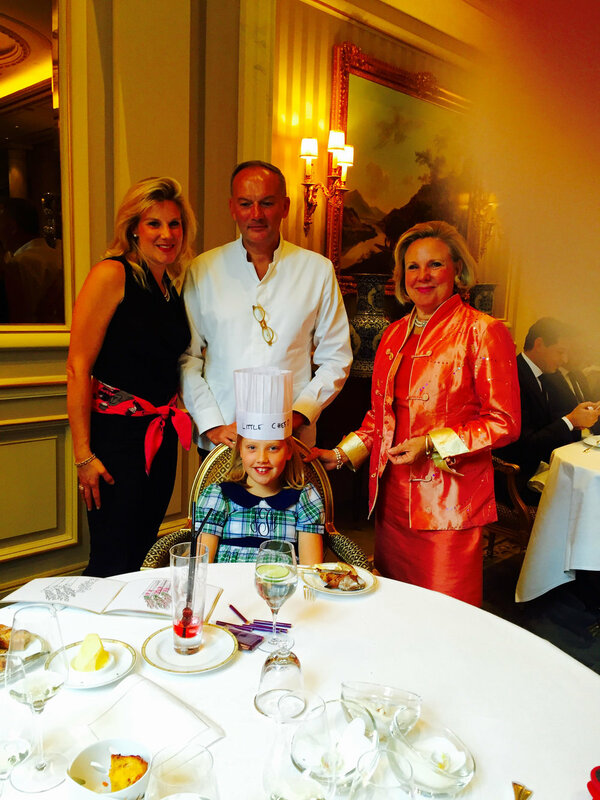 Recently, Holly and her daughter, Alexandra, were thrilled when the chef of Cinq, an exquisite Michelin starred restaurant at Hotel George V, came out to place a custom signed chef's hat on Holly's granddaughter! Such a delightful occasion for Holly to be able to introduce her fourth granddaughter to her dearest friends, especially during the Christmas holidays. 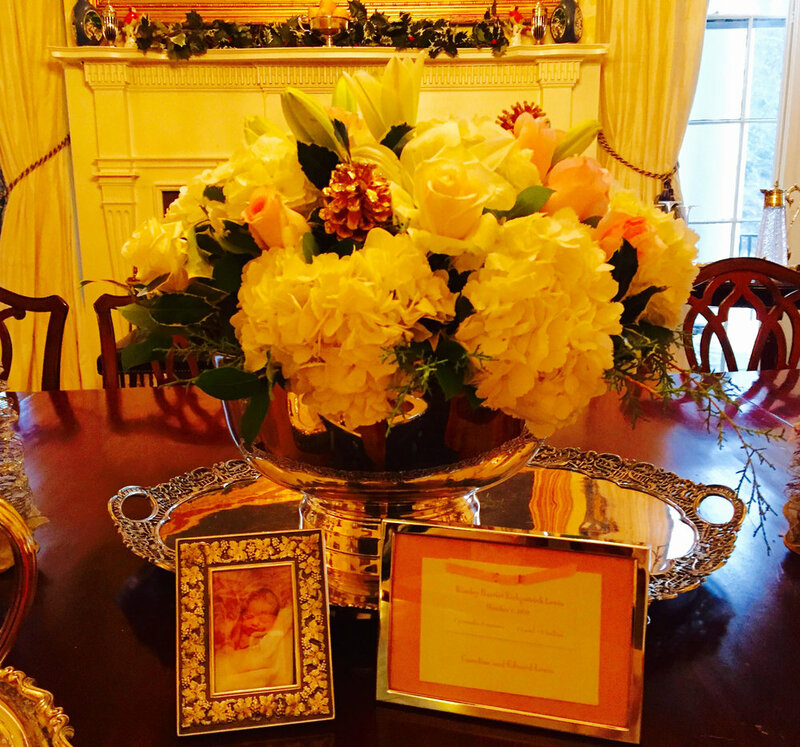 She placed two frames of her announcement and birth photo as the centerpiece. A dear friend delicately made shortbread cookies using all four of her initials... a labor of love! Holly & Stuart had a ball at the 18th annual Christmas holiday gala in Farmington with their precious friends. A few sparkling deer and ribbon candy dishes sprinkled about. 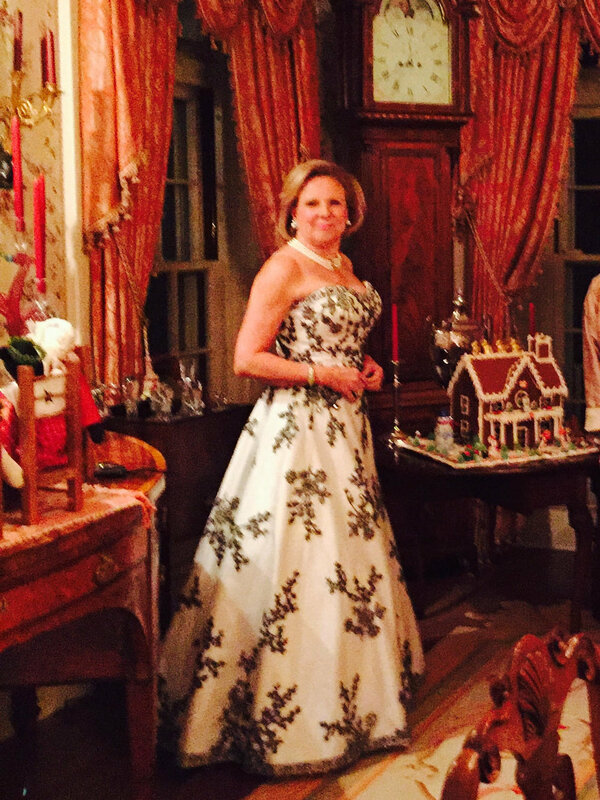 Holly enjoyed hosting Christmas Eve Dinner this past year for family and close friends, a most cherished tradition. Entertaining during Christmas time is a favorite tradition for the Holden family. Here are some of their most cherished recent memories. 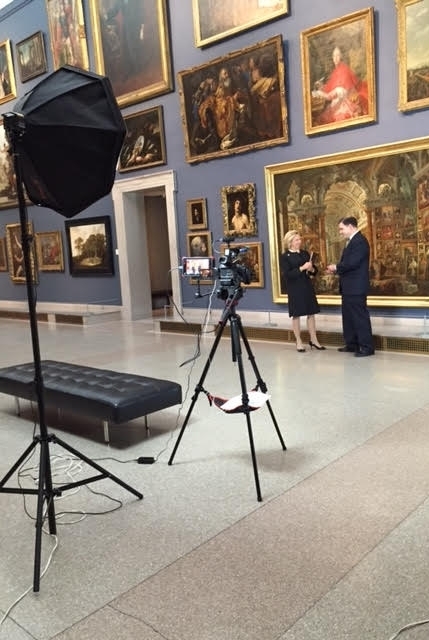 In 2017, Holly hosted a stimulating and informative interview session recorded with Mr. Thomas Loughman, Director of the Wadsworth Atheneum, the oldest public art museum in America. 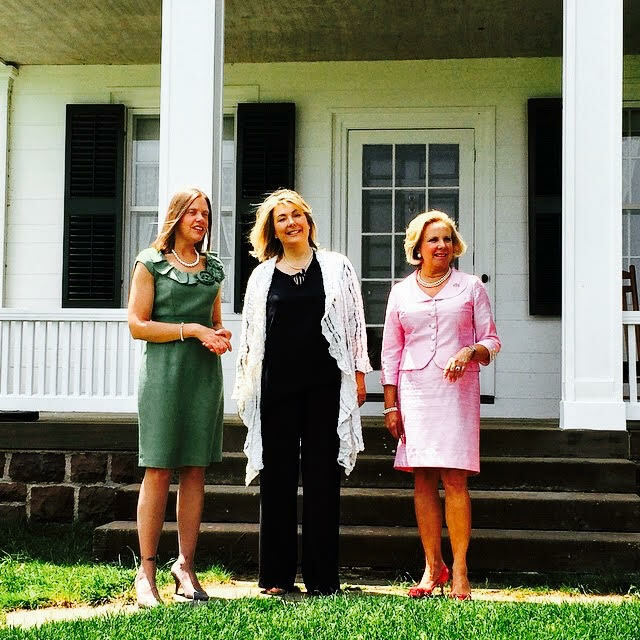 In May 2016, the Countess of Carnarvon graciously accepted Holly's invitation to visit her home in Farmington, Connecticut, Fox Hall. You can learn more about this visit here. 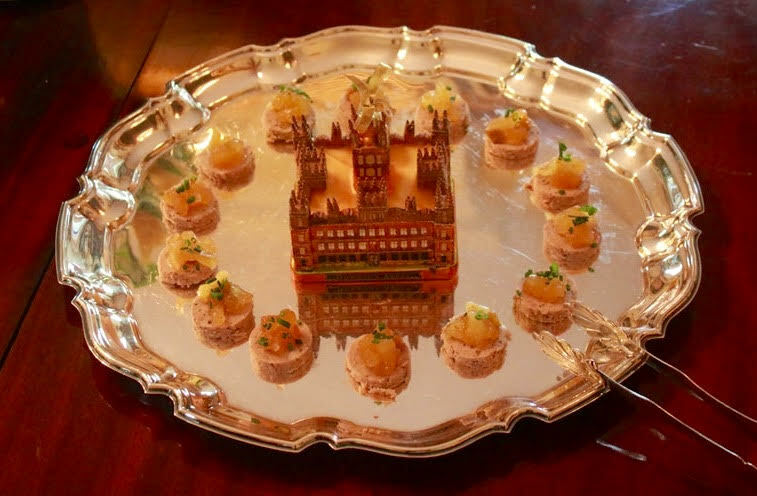 During Holly's first meeting with Lady Henrietta Spencer-Churchill, the two promptly discussed filming the Private Apartments, which she spent a portion of her childhood in when her father was the 11th Duke of Marlborough. 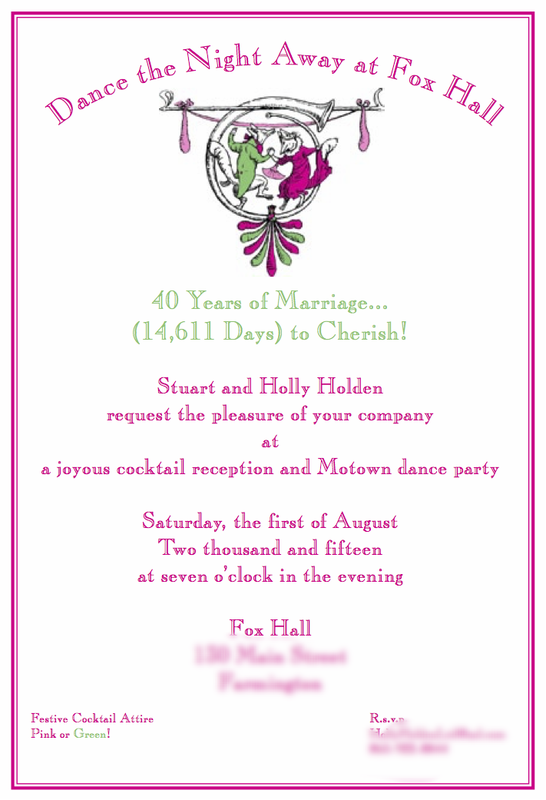 One of the best parts of hosting parties is creating the invitation to enhance the anticipation of the celebration. 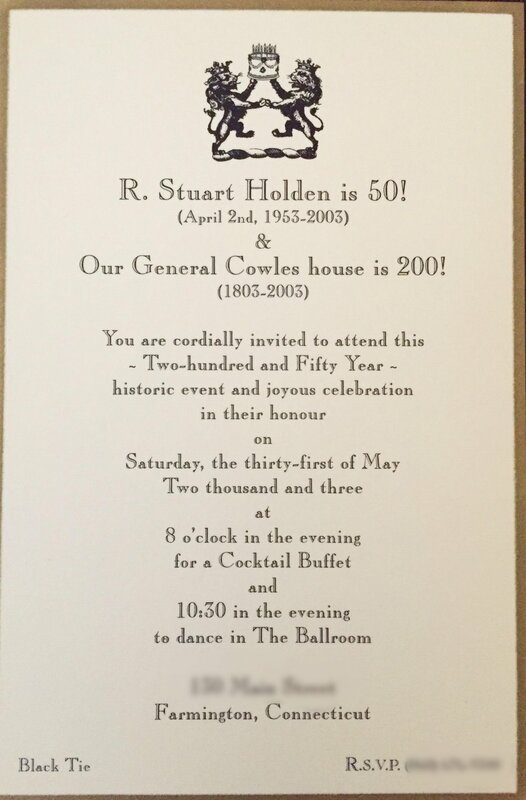 For example, Holly's husband, along with a few dear friends, share almost the same birthdate. They are all Aries (Rams) so Holly refers to them as the "Rambunctious Rams" for birthday fetes.